Todd Goodman was born in Pennsylvania in 1977, received his Bachelor of Music degree in composition at the University of Colorado at Boulder, and has studied at Duquesne University in Pittsburgh, and the Aspen Music Festival in Aspen, Colorado. He has received commissions from a wide variety of players and ensembles across the United States, and performances in Canada, Mexico, Europe and Asia as well as the USA. Mr Goodman received the Gold Farbe award from the University of Colorado film department for his scores to two short films Hypnotic Reverie and Light Autumn, the Anderson Award for composition, and the Milan Desi Derri prize for his Concerto for Alto Saxophone and Winds. 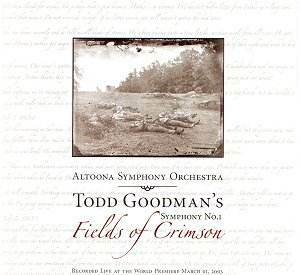 As the Altoona Symphony Orchestra�s composer-in-residence since 2002, seven works have been commissioned from him during his three season tenure - including this, his Symphony No 1, Fields of Crimson. Just how effective any piece of music is depends very largely on your expectations: and how �good� it is is determined by (as they say) �where you�re coming from�. I have a friend who regards himself as a discerning collector, but rubbishes Beethoven, and yet thinks Dolly Parton�s wonderful! So where to start with Fields of Crimson? This music is best regarded as a documentary in sound, rather than as a symphony - not even as a symphony in the American tradition. The composer�s theme is the American Civil War, specifically the "battle of Gettysburg, and the anxiousness and anguish of one family". Although it last less than half an hour, it covers a great deal of ground: the introductory movement is a quiet depiction of dawn, the noisy sounds of battle are recreated, there are bugle calls and marches galore, while reflective meditations (with a spoken narrative, written by Justin Cober - either involving or intrusive, depending on your �starting point�) link the three central movements. Extracts from reviews (in the main not authored by musicians?) posted on Mr Goodman�s website confirm my feeling that Fields of Crimson is likely to mean most to students of (or anyone fascinated by) the Civil War or American history and heritage; to pacifists; or people who need an evocative programme in order to facilitate or maximise their listening experience; and those who tend to enjoy music most when (as with film, for example) it�s part of a wider artistic concept. For such listeners, this music may indeed mean much. On the other hand, musicians and CD collectors who expect to be challenged or stimulated by new music (by its individuality, or its language, structure and ideas) are likely to be disappointed if not - to be honest - profoundly irritated. I�m afraid I found in this music very little which wasn�t commonplace, homespun and everyday. I wonder if Mr Goodman, in talking of the need for "audience connection", conceived this piece as a kind of musical annotation of a particularly significant chapter in American history - an audio aid, as it were; a musical means to an extra-musical end, rather than as music per se - or was he unwittingly offering an excuse (as others have done before him) for writing simple tonal music? The music is littered with rhythmic and harmonic clichés and off-the-shelf orchestration, springs very few surprises and - for the most part - avoids any kind of counterpoint or complexity. Now I accept that the term �symphony� (since as long ago as Stravinsky, Webern and Hindemith, in fact!) no longer promises organic growth, nor even a taut structure: but the development (such as it is) and sequence of musical material in Fields of Crimson is determined entirely by historical events, and the narrative. Mr Goodman (quite rightly, perhaps) would doubtless insist this was his intention, suggesting further that this is a kind of �history in sound� - uniquely, you might argue - rather than truly symphonic music. But, given the lightweight nature of the musical material, I cannot help feeling deceived by the (pretentious?) use of the word �symphony� - even more than its subtitle Fields of Crimson, which does at least point honestly to the heavyweight nature of its subject matter. Students of contemporary American music should be warned: this is no competitor or sequel to Adams or Corigliano, let alone Carter! Copland keeps coming to mind. And, in those moments where the music rises above the mundane, it sometimes recalls the Ives of 100 years ago - (in particular its synthesis of different musical stereotypes, and its interminable military overtones) and that�s about as �modern� and as thought-provoking as the music (in the sense of art-music) gets! The CD is beautifully produced, with very appropriate and imaginative artwork. But the recording is live (the work's first performance, in fact, on 1st March 2003) and betrays that fact with much audience noise, quite a lot of ragged ensemble, and distracting unsubtleties in individual playing. If the subject matter interests you, this is worth investigating. If you�re a sophisticated and demanding listener, and a keen observer of the leading edge of contemporary American music, this is well worth avoiding. Like I say, it really does depend - literally - on your �point of view�.